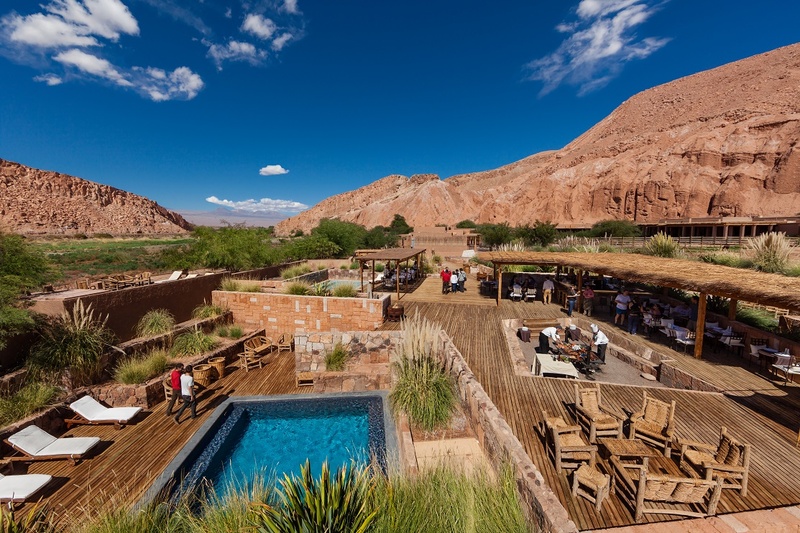 Alto Atacama is located in the stunning Catarpe Valley, next to the San Pedro River and surrounded by the Salt Mountain Range. We are dedicated to environmental sustainability and have a strong connection to the local Atacameñan culture. Our homage to the destination can be seen throughout the hotel in our architecture and interior design, "Andescape" landscaping concept, gourmet cuisine showcasing local ingredients and recipes, local Atacameñan staff and even a stable of llamas in our gardens! Our Lodge is only 3.5 kilometers away from the town square and features 42 spacious guest rooms, all of which have a private terrace and views of the gardens or surrounding mountains. We offer more than 30 different excursions ranging from bike rides and volcano treks to picnics at high-altitude salt lakes and visits to geyser fields. Our lodge also boasts a private open deck observatory for stargazing. For a more relaxing time, our Puri Spa features six outdoor pools, indoor and outdoor Jacuzzi, sauna, steam bath and our mineral baths: 7 pools of totally untreated virgin water extracted from underground aquifers.